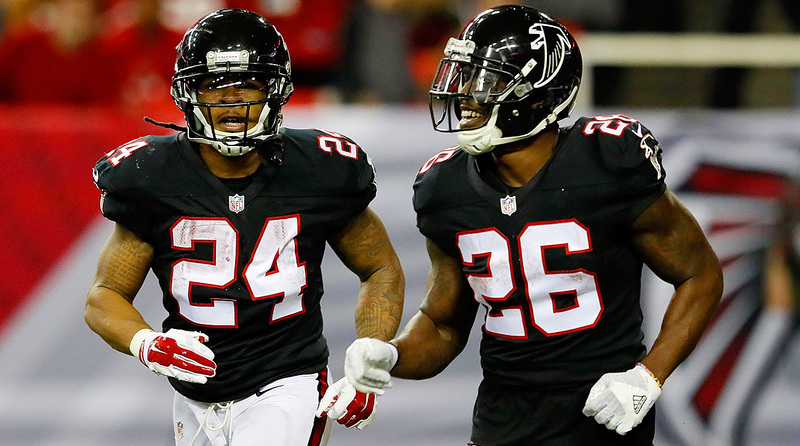 Devonta Freeman and Tevin Coleman are very different backs—but also eerily similar—and their willingness to share the load this season has been a huge part of Atlanta's success. Coach Dan Quinn stands before his Falcons in late December clutching a video remote in his right hand. His team has just won the NFC South by beating the Panthers and in a few days will clinch a first-round bye after toppling the Saints. The coach hits PLAY and a 31-yard, fourth-quarter wheel route from Matt Ryan to running back Tevin Coleman against Carolina unspools on the projection screen—but Quinn fast-forwards through most of the action. What he wants his players to see is the end of the big gain, when Coleman's fellow yard-gobbler, Devonta Freeman, bounces up and down like a pogo stick on the sideline and then chases Coleman down the field as if pursuing a windblown Powerball ticket. Freeman, it should be noted, with his two Pro Bowl nods in three seasons, is the starting tailback. He wasn't on the field for this play because of Coleman, the football equivalent of the spouse who eats off his partner's plate. In emphasizing Freeman's memeworthy exuberance, Quinn is tracing the offensive evolution of these Falcons to a selflessness that the celebration signifies. "That's the whole key," he says. "That's it, men. That's the brotherhood." Four days later Quinn's charges bash Ping-Pong balls around the locker room at their practice facility in Flowery Branch, Ga. The tables sit smack between Freeman's and Coleman's lockers, and here the volleys provide a visual representation of the team's running strategy, balls bouncing rapidly between the two backs. Around the room teammates wear T-shirts with RELENTLESS splashed across the front. The air smells of pain-relief ointment and optimism. These Falcons believe they can win the franchise's first Super Bowl, and that belief extends beyond Ryan's MVP-caliber season, the quiet athleticism of wideout Julio Jones and an offense that set a team record with a league-leading 540 points (tied for the seventh most in NFL history). 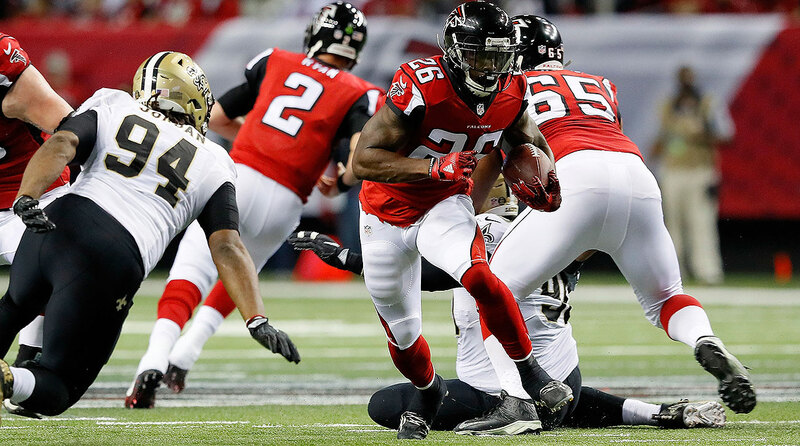 What's different about the unit this year, and about Atlanta's latest playoff push, is the prominence and production of its fifth-ranked backfield, a time share between distinctive, starter-quality backs who combined for 2,482 yards from scrimmage (the most of any RB combo in the league) and 24 touchdowns (ditto). The 5' 8", 206-pound Freeman hails from Miami, lets his dreads grow long and counts Luther Campbell, the controversial rapper and free-speech advocate, among his mentors. Coleman, 6' 1" and 210, comes from the Chicago suburbs, keeps his hair cropped short and is the great-great-grandson of Liberia's 13th president. But more important are their similarities: They're both young (24 and 23, respectively), fast (sub-4.42 40 times) and precise route runners (Quinn believes either one could start at receiver). A pro team deploying more than one running back with regularity—that's far from unusual. What is unusual: that someone of Freeman's relative freshness, after finishing fifth in the NFL with 1,634 yards from scrimmage and tying for the league lead with 14 total TDs in 2015, came back healthy and ... got fewer touches. Openly, neither back cops to hating this partnership the way that fantasy football managers do. But they'd both be lying if they said they didn't want more—more carries, more touchdowns, more accolades. The way Freeman sees it, he can believe in his talents and help his competition; those concepts aren't mutually exclusive. In fact, he believes it engenders a healthy creative tension. "I feel like I'm a top-three back, if not the best," he says. "The numbers I put up while splitting carries, ain't nobody doing those. I'm elite. But it's natural for me to help [Tevin]." Because Freeman plays nice and because the offense (which until this year hadn't ranked better than 19th in rushing since 2011) has evolved, Atlanta is tough, balanced and versatile—prerequisites for shedding the label of finesse team that isn't built for the postseason. Perhaps along the way this outfit discovered a self-help-style approach to reaching the Super Bowl. Win by sharing. "I bond with these guys more than with my own family," says Freeman (left) of Coleman and the Falcons' deep group of skill players. Campbell found Freeman on a Miami baseball diamond. The boy walked with a limp, one leg being longer than the other, and suffered regularly from cramps, but he still stood out for his aggression and athleticism. Dispositionally, he took after his mother, Lorraine, a humble woman who raised seven children in the crime-riddled Pork 'n' Beans projects. In high school Devonta came off the bench until his senior season; Seminoles coach Jimbo Fisher noticed Freeman while scouting the starter in front of him. After Freeman committed to FSU, he stuck around even when James Wilder Jr., ranked by some as the nation's top tailback recruit in 2011, signed there too. This season, when Freeman was faced with what Yogi Berra would call "déjà vu all over again," Campbell pointed out the pattern and urged the back to stay level-headed, to remain the guy who worked out one day after the Pro Bowl, who saved every game and bonus check after his rookie season. "What you're going through, you've done it before," Campbell told him. "This is the story of your life. Keep doing what you're doing." Tevin Coleman was born 10 weeks premature, weighing 3½ pounds, and then spent the next two months in the hospital, mostly in an incubator. He was small enough to fit into one of his parents' hands. Growing up, he never sat still, pinballing around the house. His father, Wister, who'd immigrated to the U.S. as a teenager, searched for ways to burn Tevin's excess energy. He took the boy to the batting cages and put him in martial arts and music classes. One day, after a piano lesson, Wister took a back road on a whim and passed a football practice. Pulling over, he signed up his son and told the coach, "Just give him the ball." That's how the great-great-grandson of former Liberian president William David Coleman became a running back. Like Freeman, Coleman was often his team's best player but never a solo practitioner. At Oak Forest (Ill.) High he was the wing in a wing T offense, averaging 11.4 yards per carry his senior season but rushing only 83 times. Because of his top-end speed, schools like Michigan State, West Virginia and Oklahoma courted him as a cornerback or hybrid player. In the end, Deland McCullough, the running backs coach at Indiana, sold Wister and his son on immediate playing time at Tevin's preferred position. McCullough still remembers the first time he saw Coleman run, competing in the long jump at an Oak Forest High track meet. The kid was so explosive that the coach nearly dropped his hot dog. In Bloomington, McCullough taught Coleman the finer points of his position—how to find seams inside the tackles and pick up blitzing 'backers—and in 2014, his junior season, Coleman threatened the NCAA record for average yards per carry, finishing at a 7.5-yard clip (0.31 off the mark) and rushing for 2,036 yards despite playing only three quarters of the Hoosiers' offensive snaps. NFL teams noticed, and that December, like Freeman before him, Coleman declared early for the draft. (Freeman went in the fourth round; Coleman in the third.) "[Tevin] wanted to play in Atlanta," Wister says. "He wasn't concerned about the split. I said, 'Wow, you're a better man than I am.'" When Coleman arrived at 4400 Falcon Parkway that off-season, Freeman was the first to greet him. "Wassup?" the vet said, hand extended toward his rookie competition. Freeman would view his tutelage as no different than when Julio Jones had doled out tips about sleep, hydration and nutrition, or when Matt Ryan spent extra time helping him learn the playbook. "It really did surprise me," says Coleman. "I thought he'd be hating on me, but it wasn't like that. We've been close ever since." After injuries kept his rookie year from ever getting off the ground, Coleman has become a central part of the Falcons' diverse offense. The man known by players as OG Bobby T does not care for nicknames, even if his does sound lifted from a hip-hop roster. Bobby Turner, 67, would prefer something simpler, though. Like Coach. This marks OG Bobby T's 44th season with that job title, but football historians know him best for the campaigns he spent with the Broncos, from 1995 through 2009, when he developed six different 1,000-yard rushers and won two Super Bowl rings. Turner mentored bruising backs like Terrell Davis and shifty backs like Clinton Portis and journeymen backs like Reuben Droughns—and, invariably, their careers overlapped. Turner turned to tandems (or at least thrived with them) long before seemingly every team had one. Like Denver's coach, Mike Shanahan, Turner favored flexibility over any certain type of running style. He wanted options: speed and athleticism, pass catchers who could also plow forward or sprint off tackle and showcase creativity in space. One of Turner's favorite books is Sun Tzu's The Art of War, which includes this passage: "The ultimate in disposing one's troops is to be without ascertainable shape." That May, sticking to Turner's philosophy of flexibility, the Falcons drafted Coleman. Instead of backs with complementary strengths, they now had two who did myriad things well, with only slight variances; less thunder-and-lightning than lightning squared. The NFL has long been trending toward multipurpose backs. This season the Cardinals (David Johnson), Steelers (Le'Veon Bell), Cowboys (Ezekiel Elliott) and Bills (LeSean McCoy) all made adaptable runners their offensive focal points. The Falcons, not long ago criticized for being one-dimensional, have used similar puzzle pieces to create an offense "without ascertainable shape." Atlanta remains the only playoff team with two backs each graded in the top 20 by Pro Football Focus. Over his 15-year NFL career, Falcons pass rusher Dwight Freeney has marveled at several prominent backfield duos—Jonathan Stewart and DeAngelo Williams in Carolina, Fred Taylor and Maurice Jones-Drew in Jacksonville—but none as versatile or as productive as this pairing. Freeman is squat, shifty, always capable of making defenders miss. Coleman is slightly faster but less shifty; he's looking for an angle, a single cut, followed by a gallop into open space. "Usually you see a bruiser and a slasher," Freeney says. "With these guys, it's another dose of the same deadly stuff." That added flexibility, Jones says in a quiet moment at his locker, "is the key to everything we do." There are three days before the wild-card round begins and the Falcons have a bye, but they're practicing anyway. Afterward Freeman is in the treatment room, where a doctor plunges a syringe into his arm. The back screams. Yes, he has plenty of tattoos, but he's actually afraid of needles. He can look at the same thing—a needle, a backfield split—from two vantage points, he says. He sees himself as an elite back—one who just happens to split time. What matters more, he says, is that the Falcons have assumed that attitude collectively, that they're closer this season than in years past, that they spend more time together off the field. Turner says he noticed that cohesion in training camp, when fullback Pat DiMarco began inviting fellow backs to his house or out to dinner. DiMarco later hosted his teammates on Thanksgiving, serving sweet potato casserole and a 29-pound turkey. "I bond with these guys more than with my own family," Freeman says, nodding toward Jones in the neighboring locker and Coleman across the way. He's asked about the last time he felt this close to his teammates. "The national championship year," at Florida State, he says. He laughs again at the implication. Freeman is aware that no tandem lasts forever. He knows that one reason his team excels is the synergy of two backs whose production far exceeds their paychecks. His contract ends after the 2017 season, for which he's due just $800,000 in salary and bonus money. Coleman's contract expires a year later, and he's being paid similarly. For roughly $1.5 million, the Falcons bought 24 touchdowns in '16, making their backfield one of the NFL's better bargains. But for all the collective goodwill, both runners know this arrangement can only last so long. Freeman is taking "a pragmatic approach," Campbell says. "He's not going to be a problem [about his contract]. But don't get it twisted. He's not naïve. Ain't no player as great as he is want to share reps. The Falcons have been making payments on a Volkswagen, [but] they're driving a Maserati." Come contract time, he adds, "we'll find out how much they love him." Speaking for himself, Freeman says he'll consider his situation this off-season. Next year he thinks both he and Coleman could surpass 1,500 yards from scrimmage, an NFL first. Says Turner, "I don't want to put a lid on their container." If Turner has earned a nickname, then some think his backfield deserves one too. The Falcons pushed for Run D&C this season, but it never stuck. And maybe that's just as well. It's not the spotlight that has defined Atlanta's backs; it's how easily they've shared it.